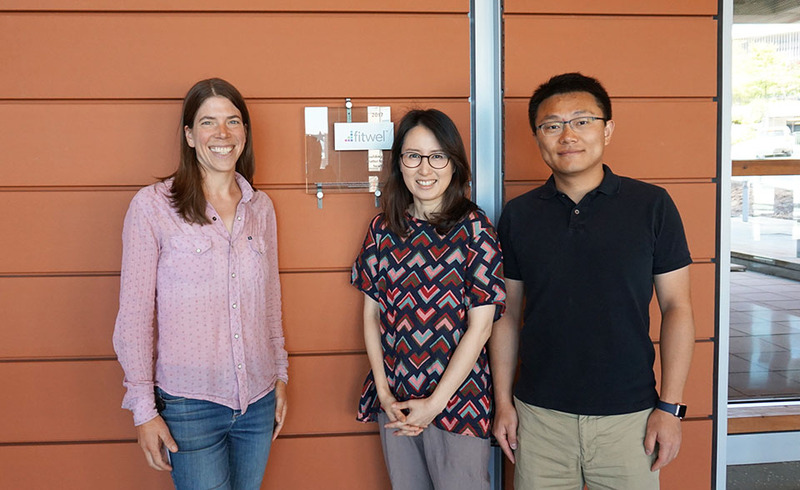 Standing in front of the Fitwel certification plaque at Bellevue City Hall are city resource conservation manager Emma Johnson, assistant professor Amy Kim and post-doc Shuoqi (Stanley) Wang, from left. Considering that most people spend one-third of their day at work, UW CEE researchers are advocating for healthier buildings. And they aren’t wasting any time. The first government building in Puget Sound, Bellevue City Hall, recently gained Fitwel Certification thanks to their help. “Since the built environment affects human health, the certification symbolizes the city’s commitment to promoting health-conscious individual behaviors and furthering community engagement,” said assistant professor Amy Kim. As Fitwel ambassadors, Kim and post-doc Shuoqi (Stanley) Wang guided the City of Bellevue staff through the process of gaining Fitwel Certification for Bellevue City Hall. One of the leading certifiers of healthy buildings in the United States, Fitwel was developed in recent years by the U.S. Centers for Disease Control and Prevention and U.S. General Services Administration, and is operated by the Center for Active Design. Through thoughtful design and operations within buildings, Fitwel encourages the adoption of 63 strategies that encourage healthy behavior by occupants. Based on research evidence, the strategies range from providing outdoor spaces to enhancing the visibility of stairwells to providing healthier food and beverage options in vending machines. The CEE researchers worked collaboratively with City of Bellevue staff, advising them on the steps to take to achieve certification. The researchers and city staff worked within the existing building’s structural framework, as drastic changes to building operations were unlikely in the short term. Acquired from Qwest, the 350,000 square foot building previously housed telecommunications equipment. 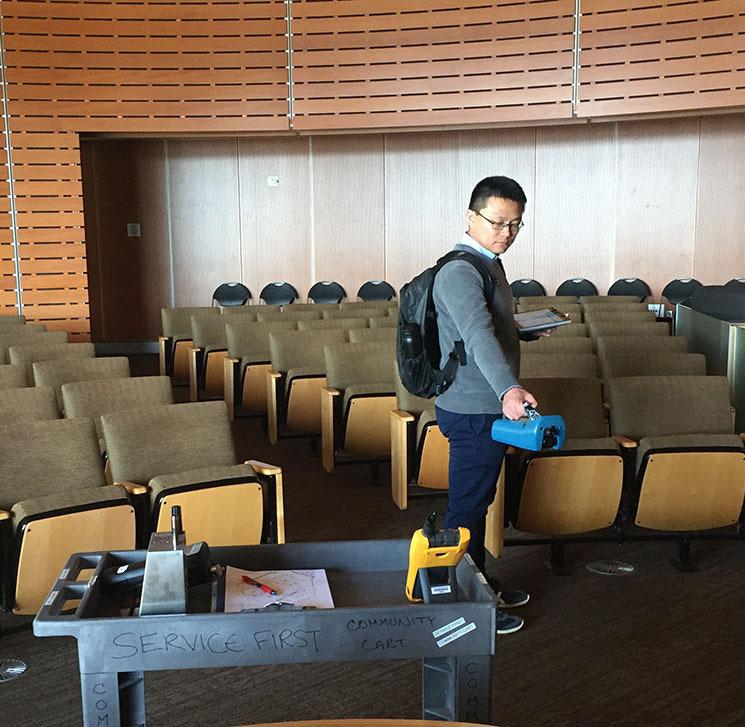 Post-doc Shuoqi (Stanley) Wang monitors the indoor air quality inside Bellevue City Hall. Enhancements that were discussed included adding signage to encourage occupants to increase physical activities in the building, such as signs near stairways that say “stairway to daily health”; encouraging the use of standing desks and ergonomic furniture; documenting the indoor air quality and green purchasing policies; improving lactation rooms; and distributing green cleaning kits to enhance indoor air quality. Out of a total possible 144 points, Bellevue City Hall earned 92 points, receiving a one-star rating. City Hall did especially well in points associated with walkability, transit access and emergency response. The city hall project took about nine months to complete, with included conducting an assessment, implementing building enhancements and applying for certification. Next up, the researchers have their sights set on certifying the first educational building in the Puget Sound. They are currently exploring certifying a newly renovated space at the UW Tower. The healthy building concept builds on Kim’s research to develop sustainability strategies for buildings that promote the wellness of occupants. In a recent graduate course, she installed solar panels on the roof of More Hall to power office equipment.